As a toddler, I was mostly an excited observer during the Christmas tree decorating process. Tiny little fingers and fragile, cherished glass ornaments are, after all, not a good pairing! That said, there were a few non-breakable decorations I was allowed to hang: one was a little manger, pictured here. Vague recollections of those early Christmases stayed with me. By the time I reached middle school, my siblings having long since left home, decorating the tree became a joint collaboration between my mother and me. Pulling the little manger out of the ornament box always brought a smile to my face. Mom and I continued to act as the “decorating duo” under she suffered a massive stroke when I was a junior in college. That year, for the first time, preparing the house for Christmas was my job to complete alone. Now it was my mom who was the observer. I’ve put a lot of Christmases under my belt since then. Mom passed away. Dad joined her in heaven eight years ago. There have been other deaths. Births, too. The family home belongs to someone else now. For all the happy events, there have been just as many – if not more – profoundly difficult ones. 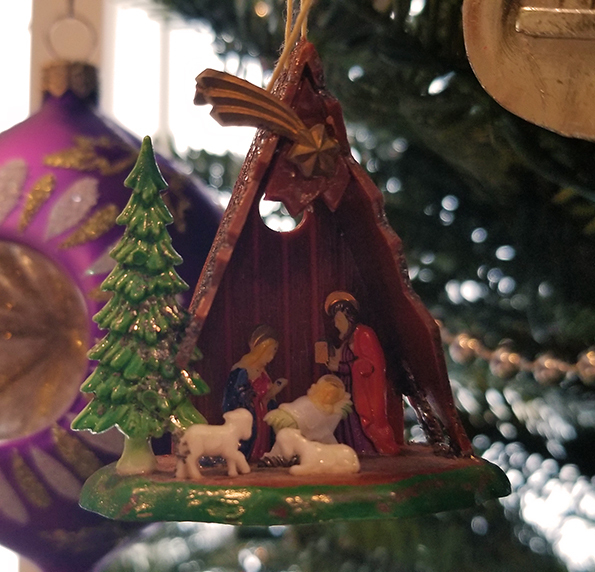 Yet, as I opened my ornament boxes to decorate my tree the other day, there was that little manger – looking just as it has every Christmas since I first remember hanging it as a tot: the Baby Jesus laying there peacefully in the manger. I placed it in its usual place of honor, front and center. While much has changed, the most important thing remains the same. Wishing you and yours a blessed Christmas.